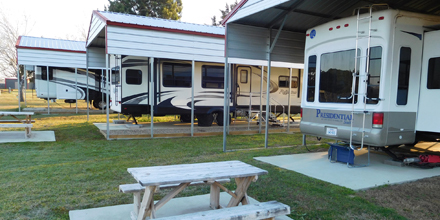 Our monthly RV site rental rates range from $295 to $430. Since we just recently opened, Roadrunner Acres RV Ranch is offering specially discounted rates to our initial residents for all of our RV sites throughout the rest of this year. All utilities—water, sewer, and WiFi—are included in the rates shown below, except electricity (we charge you only $.11 per kWh, which is exactly what Wood County Electric Co-op bills us). Satellite TV and/or a dedicated high-speed DSL Internet connection can be provided for an additional monthly fee.